An osprey passes overhead at Chino Farms in Chestertown, Md., on March 11, 2016. The migrating raptors reappear in Maryland every spring starting around mid-March. Found throughout the tidal portions of the Chesapeake Bay, including its shorelines, marshes, rivers and open waters. One of the most widespread birds on earth; found on every continent except for Antarctica. Arrive in the Chesapeake Bay region in early March and remain here through spring and summer. Begin to migrate southward for the winter in mid-August. Also known as the fish hawk, the osprey is a large raptor with distinctive brown and white patterning. It visits the Chesapeake Bay's tidal waters, including its shorelines, rivers and marshes, from spring through late summer. The osprey can grow up to 2 feet in length with a wingspan that reaches up to 6 feet. 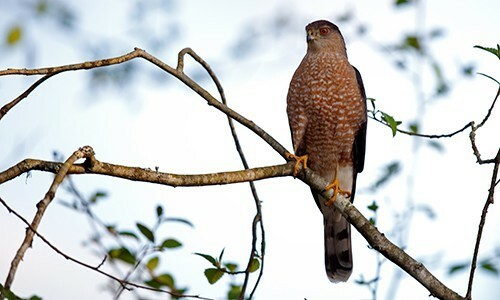 Its hawklike body is patterned with brown and white, including a brownish-black back, black patches in the crooks of its wings and a white head and belly. A broad black stripe runs across its yellow eyes toward the back of its head. Females have a "necklace" of brown-tipped breast feathers. The osprey feeds almost exclusively on medium-sized fish, including perch, shad and menhaden. It hunts for food while flying high above the water. Once an osprey spots its prey, it will hover in the air while beating its wings before diving toward the water and plunging in, feet-first, to capture its meal. Back in the air, the osprey will rearrange the fish in its feet so the fish is facing forward. This reduces drag, making it easier for the osprey to fly. 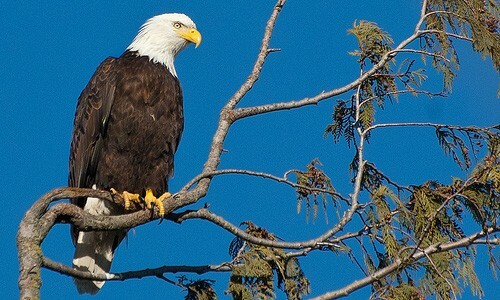 Adults are vulnerable to avian predators like eagles and large owls ;Eggs and nestlings are vulnerable to raccoons, snakes and other climbing animals. Osprey can be identified in flight by their crooked wings, white underparts and black eyestripes. 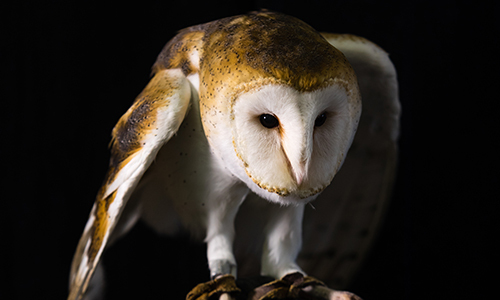 Up to five different calls have been recognized by researchers, used for begging, alarm, courtship and nest defense. The most frequent call is a piercing, chirping cheep-cheep or yewk-yewk. When they are near their nest, ospreys may make a sharp, frenzied cheereek. Monogamous, ospreys reach sexual maturity at age three and often mate with the same partner for life. Adults return each year to nest in the same area in which they were born. Experienced breeders begin to arrive at old nest sites in late February or early March, while less experienced breeders arrive later in the season and can spend several weeks finding a mate and nesting site. Males arrive before females. Courtship and nest building or repair begin once a pair has reunited. Large, bulky nests are built using branches, corn stalks, shoreline debris and other materials. Nests are often located near the water on tall structures like dead snags, utility poles, channel markers and nesting platforms. Females lay three eggs between mid-April and late May, which are speckled with beige and brown spots. Incubation lasts for 38 to 42 days. Eggs do not hatch at the same time. The first chick may hatch as many as five days before the last one, and the oldest chick often dominates over the younger nestlings. If food is limited, this behavior can cause younger chicks to starve to death. Nestlings are brooded and fed fish for about 40 days after hatching. After this point, nestlings begin to resemble adults, but have reddish-orange eyes and feathers edged in buff. About 55 days after hatching, young begin to fly. Families remain together near the nesting site through July, as fledglings learn to fish. Adults begin to migrate to their wintering grounds as soon as fledglings become independent. Juveniles usually migrate during the last week of August. Ospreys are one of the largest raptors in North America and one of the most widespread birds in the world. They are found on every continent except for Antarctica. Approximately one-quarter of all ospreys in the contiguous United States nest in the Chesapeake Bay region. Osprey populations have slowly recovered since the middle of the twentieth century, when widespread use of the pesticide DDT caused the species to decline.